The risk of a child dying in a fire is lower today compared to a decade ago thanks in part to fire education and safety program. But the statistics are still a cause for concern as playing with fires account for 67% of structure fires between 2007-2011 causing 77 deaths, 750 injuries and property damages amounting to $172 million according to Campbell’s Report. Teaching kids about the importance of fire safety, how to be safe in the kitchen, around fires and electricity can save their lives and that of others. Effective communication is an important tool in safety management. While it is difficult to get your message across young children as their brains are not fully developed to understand the idea of danger, you can repeat the message often or show examples. The concept of fire must be explained to young children telling them that they should not stick their fingers in electrical outlets, play with matches or lighters, touch a hot oven or a fireplace on the wall. For younger kids between the ages of 2 and 5, it is best that you take precautions by child-proofing outlets, locking flammable materials, and setting appliances such as washing machines and ovens with the child safety lock. Installing smoke detectors and fire extinguishers & blankets are good practices. For children 5 years and above, talking about fire prevention & safety will have an impact as the concept of danger is enhanced with age. However, the awareness of danger is still low in younger children (9-10 year-olds) compared to adults according to Hill et al. While their schools are surely going to enforce fire safety drills, equally, teaching them how to be safe at home is critical. They should never play with fires whether it is a gas stove, barbecue lighter or matches. 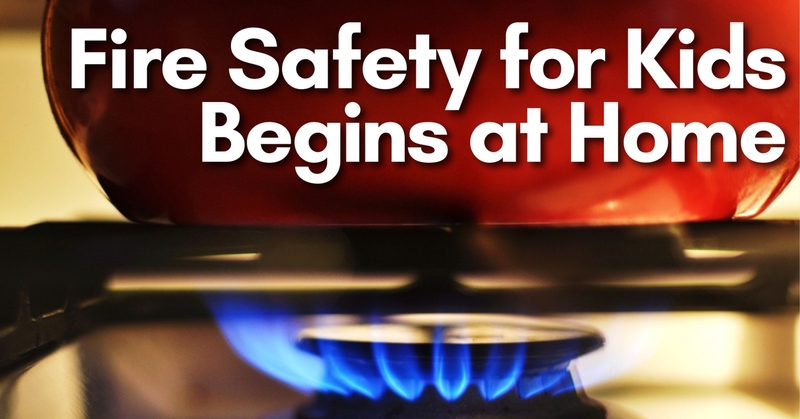 Once there is a fire, instruct them to alert an adult or an older child. The fire department number should be memorized or noted on the ref door in case there are open flames in the house. It is not enough that you talk about the dangers of fires to kids. An evacuation plan must be prepared so that they will know what to do in the event of a fire at home. Accidents can and will happen so it is imperative that your kids and everyone in the family are prepared. First, identify exit points in every room of the house. Since kids will most likely stay in their bedrooms or the living room, ensure that there are at least 2 ways to leave either through the window or the door. If bedrooms and dens are on the second floor, there should be an escape ladder that can be used to escape. When smoke is present, children should be trained to stay low on the ground. Practice with them how to find their way out of their bedroom with their eyes closed. And once they are out, they should remain there and not go back to the house for anything that they left behind such as a toy or even a pet. Also, it is vital that you educate kids on how to use a fire extinguisher if they are already old enough and able to do so. Knowing how to ‘stop, drop and roll’ when their clothes catch fire is essential as learning how to use a fire blanket to snuff out flames. Fire safety and education are important in preventing fires in home structures and in ensuring that everyone knows what to do in case the unthinkable happens. For children, teaching them the basics of fire prevention can prevent disasters and save their lives. Jennifer Dawson is a busy working mom, with two small girls who keep her on her toes. When she's not busy parenting, she works as a researcher and writer, with a keen interest in how other busy parents can save money and look after their homes and families with ease. In her free time she's got a selection of pets to look after and she also volunteers for a number of local mental health charities.